I never really considered the Stokke crib before because I wasn’t crazy about the completely oval shape of it, especially not as a toddler bed. But then I saw the little bassinet version of it and sort of changed my mind a little. The mini crib is lovely and so practical that it has wheels and can be easily moved from room to room. This would make those first weeks so easy when baby sleeps all the time and when we will keep the crib in our bedroom. With a conversion kit you can turn it into a full-sized (oval) crib. And then it can be made into a toddler bed, and beyond that into a day bed or two armchairs. 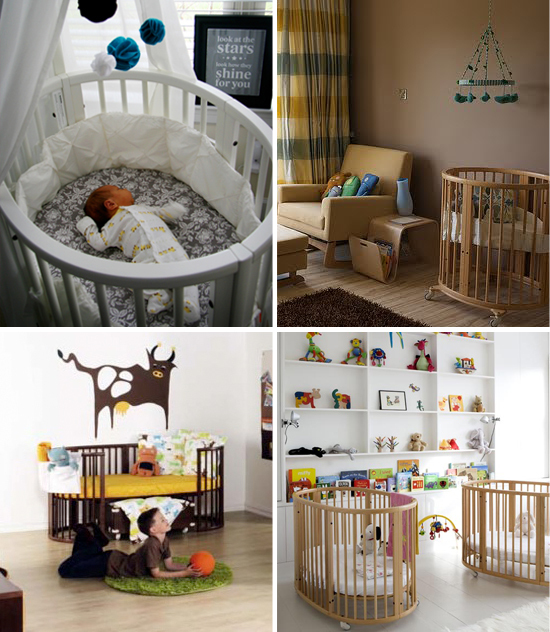 The full system with mini crib and regular crib together costs USD 1000. Just the crib is around USD 800.